Ride on the first public train through the Aberglaslyn Pass. Cross the high girders of the last steam railway in Central America. Roll through superb New Zealand South Island scenery on the Kingston Flyer. Thrill to the sight and sound of the restored WW1 Baldwin 4-6-0T, on the Leighton Buzzard Light Railway. See the recreated Eaton Hall locomotives, and ride the thrilling footplate of the Ravenglass and Eskdale Railway. Ride the rack of the Achenseebahn, and hear the ancient locomotive thrash up the hill. Visit the island of Majorca and enjoy the narrow gauge railways with electrics older than many preserved steam locomotives. Be astonished at the 12 car trains on the Mariazellerbahn 2’6” gauge main line railway, with steam at the top! See a Darjeeling engine visit New Jalpaiguri, and then be thrashed up the line in one of the fastest trips ever. It’s a real thrill! Material from three cameras has been gathered since 2005 to make this video, the first of two. 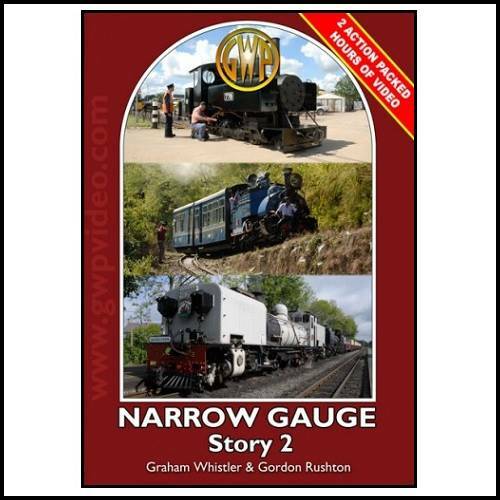 If you like narrow gauge, then Narrow Gauge Story 2 and the next programme, Narrow Gauge Story 3, are for you. Two hours of well photographed, non-stop action, well put together, with a really informative commentary. Running Time - approx 120 minutes.